From head basin of Black Birch Creek climb a series of bluffs to gain the summit ridge about 200 metres horizontally from the top, then follow the ridge. This is best approached from the north branch of Black Birch Creek but can also be reached via steep couloirs from the south. From the col slightly north-east of the peak, pick a gully to access the East Ridge and follow the ridge to the summit. The col between the high and low Thumbs is readily accessed from the west. From the col pick a route through steep, loose argillite to the summit, climbing a narrow, left-facing corner if conditions dictate. 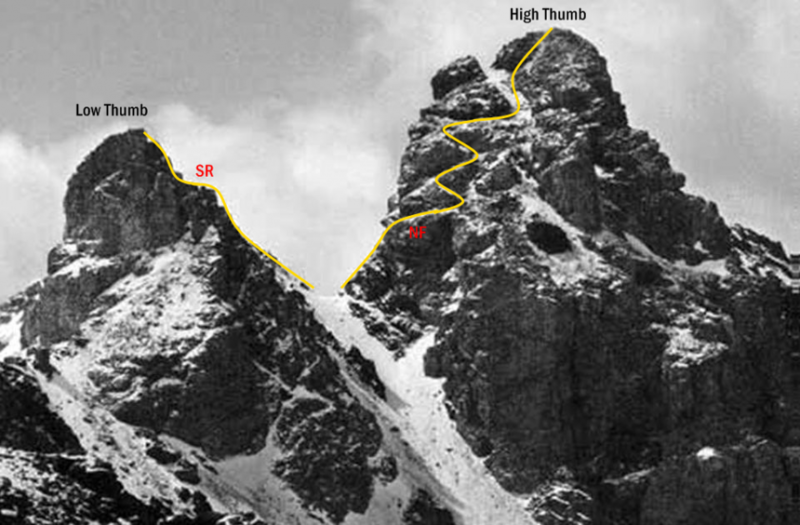 The col between the high and low Thumbs is readily reached from the west. From the col, cross a band of argillite then zigzag along ascending ledges. Finish by climbing either blocky rock or a scree gully on the right to the broad summit. The rock is reasonably firm. Climb a narrow couloir north of Tom Thumb Col. The couloir merges with steep, loose rock and narrow gullies but joins the South Ridge near the summit, avoiding deep chasms and steep walls at the south end of the ridge. Climb the steepening ridge, taking occasional detours to the west side of the arête and negotiating a short step just before the summit. Alternatively, the South Ridge is readily reached via scree from the western side of the col north of Pt 2315 metres.